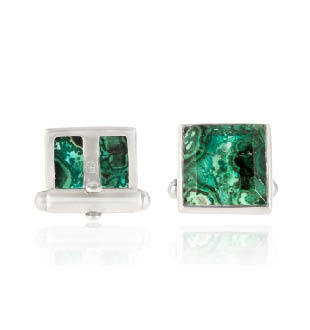 A pair of solid sterling silver square cufflinks with inlay of chrysocolla. Keiko Uno’s Love Thy Ocean series begun with the creation of a love heart shaped pendant crafted out of two hand turned pieces of chrysocolla set in sterling silver inspired by the ‘Heart Reef’ of the Great Barrier Reef. Since then, Keiko Uno has used this vivid blue green coloured mineral rock with an eye-catching mottled pattern to create works that are reminiscent of the aerial view of the ocean surrounding some of her favourite island holiday destinations. 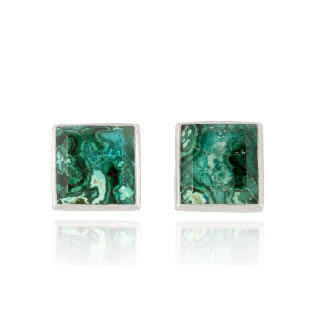 The Love Thy Ocean series forms part of Keiko Uno’s luxury sterling silver Rockpool Collection.